Vavoom! News April 2010 | Vavoom! 1. 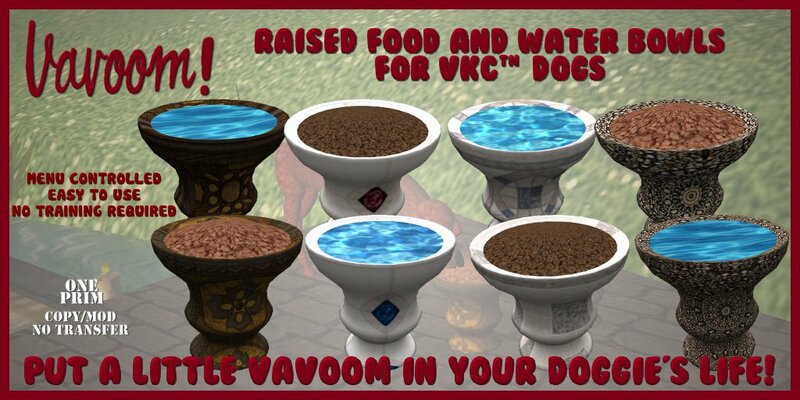 The New Raised Food and Water Bowls are only One Prim and have individually Baked Textures. 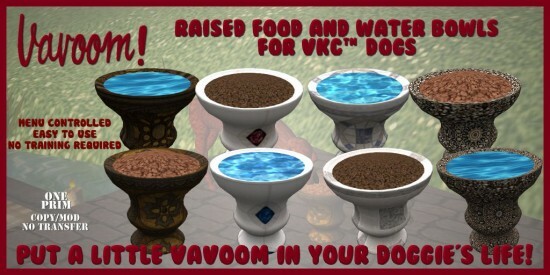 There are four designs with a food bowl and a water bowl for each design. As you would expect, the bowls are copy and modify so that you can resize them to suit your dogs and you get a standard size and a small size with each purchase. They’re available individually or in twin packs . There is a discount for the twin packs. You can view them and try them out at my Main Store. 2. 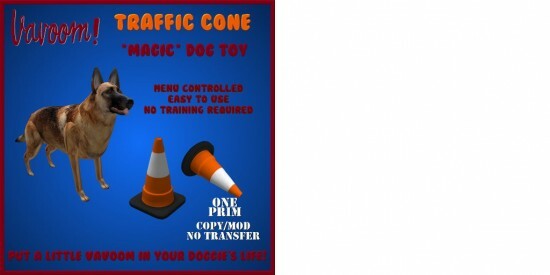 The New *Magic* Toy this month is a Traffic Cone. I was reminded recently of a story about a German Shepherd Dog called Chloe who thought that traffic cones were the best toy ever. She’d take her cone into the garden and drag it around shaking and chewing it until it was reduced to small pieces of plastic. The trouble was she’d see one in the street and want to do the same thing to that too. This is my tribute to Chloe. There are two types in the pack, one with a square base and one with a round base. By the way, it was my turn to provide an item for the Grid-wide Hunt that Turing Isle is taking part in this month. I put the Traffic Cone in, so if you hunt around a bit, you can get it for free. 3. The Update for Sam’s Dog House is a small bug fix. If you bought one of these cute colour changing houses last month, you may have noticed that it failed to return from the Colours Menu to the Main Menu when the button was clicked. This update fixes that bug. This applies to Sam’s Dog House if you purchased it before 2 Aprl 2010. The other dog houses are not affected. 4. The updates to the Food and Drinking Bowls add a couple of new features and also include some general tidying up of the code to make it more efficient. You can now set the range within which the bowl will call the dogs. Don’t forget that if you purchased your bowls in my “Mega-Pack”, you need to use the Mega-Pack Updater instead of the bowls one when you come to collect. This applies to all Vavoom! Bowls purchased before 2 April 2010.